the changes that occur in the skeletal musculature during postembryonic larval development. The species studied, Epicauta segmenta (Say), like others belong­ ing to the coleopterous family Meloidae, is characterized by hypermetamor­ phosis (SELANDER and WEDDLE, 1969). The egg develops into an active, well sclerotized larva that searches for grasshopper eggs, which, as in the case of all species of Epicauta, serve as the sole larval food. 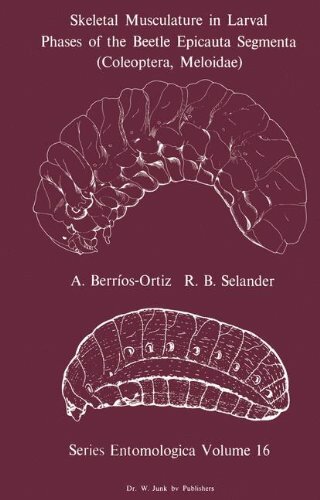 This triungulin phase of the larval stage, as it is called, is followed by the first grub phase (Fig. 1), during which the larva continues to feed and undergoes several molts. After feeding is completed the larva commonly enters a sessile, diapausing coarctate phase in which the integument is heavily sclerotized and the appendages, including the legs, are vestigial (Fig. 2). Following this the larva attains an active second grub phase (Fig. 3) closely resembling the first grub phase in external anatomy. Normally, the second grub phase leads directly to pupation and the formation of the adult. An alternate, abbreviated developmental pattern, involving pupation immediately after the first grub phase, is also recorded in this and many other species of Epicauta.